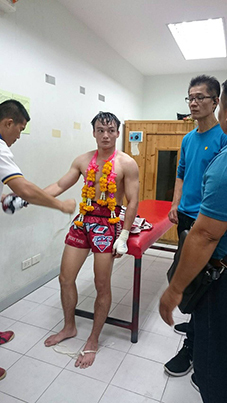 The gym where Petchatsawin Sitsarawatsuea belongs is a prestigious gym with many active champions, and Petchatsawin Sitsarawatsuea himself is also in the ranking. 1R is a right low kick which WRro are good at. However, Petchatsawin Sitsarawatsuea returns a middle kick and defends Shiro’s continuous attack. 2R, both of which raised the attack speed. Shiro’s low kick starts to gradually become effective. 3R, To avoid Shiro’s low kick, Petchatsawin Sitsarawatsuea will shorten the distance with Shiro. Shiro’s attack was single-shot, and the timing of attack could not be adjusted well. 4R, Shiro’s elbow attack hits the face of Petchatsawin Sitsarawatsuea. Petchatsawin Sitsarawatsuea trying to form a sumo wrestler. Shiro also attacks with elbow attacks and kicks. The multiplication rate is equalized. 5R, I’m forced to suffocate in suicide, Petchatsawin Sitsarawatsuea. I tried to decide a middle kick, but Petchatsawin Sitsarawatsuea caught Shiro’s foot. Shiro’s balance has collapsed. Finally, Shiro’s judgment was lost. Although the game lost, the content of the game was very sophisticated. This experience should lead Shiro to the next victory.